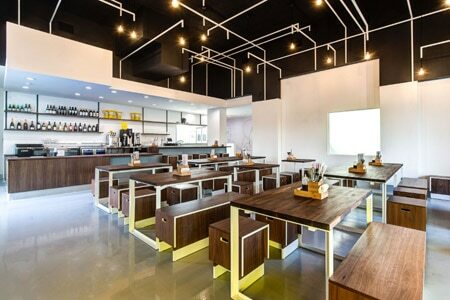 Contemporary, cozy spot for ramen in Atwater Village. : Chef/owner Paul Yi brings signature ramen and more to Atwater Village in a chic, modern corner space on the main drag of Glendale Boulevard. The high-energy neighborhood eatery --- described by Yi as a “community restaurant” --- hosts an avid Eastside crowd beneath its geometric constellation of lights, happily slurping up noodles or lingering on the charming sidewalk patio over a glass of rosé. 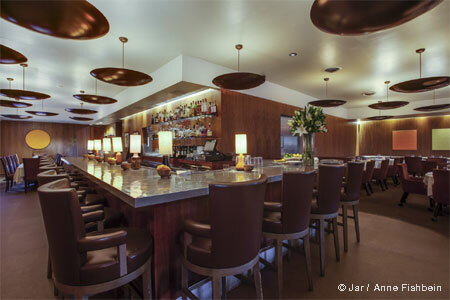 Japanese and Korean influences permeate Yi’s menu. Graze on avocado toast with yuzu guacamole, or the savory “chicken fried” tofu. If you’re feeling a bit decadent, creamy kimchi udon shrimp is a luxe Asian carbonara swimming with sweet-fleshed rock shrimp and salty bits of Spam. Undoubtedly, the most popular draw is the signature Ozu pork ramen, with full-bodied noodles in a delicate, savory pork and chicken broth, punctuated with Kurobuta pork belly, ajitama egg, mizuna and pickles. Chicken ramen gets a zip from black garlic oil, and vegetarian miso ramen harmonizes mushrooms, tofu and spinach noodles. The curated list of boutique wines includes interesting finds from California, France and Spain; there are several Craftsmen Brewery taps, as well as handcrafted sodas in shiso and yuzu ginger flavors.